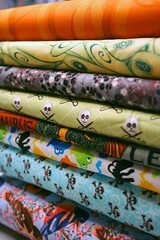 My new fabrics from Equilter arrived! Also, my new Vogue patterns arrived AND I went to the awesome vintage store and got buttons with toadstools and four leaf clovers on them. How could the day get any better? Tagged Accessories of Old, button, buttons, cotton, equilter, fabric, flannel, pattern, patterns, Stash, store, vintage, Vogue.